Shaker A. Mousa elected Fellow of the National Academy of Inventors (NAI) – class of 2018! Election to NAI Fellow status is the highest professional distinction accorded to academic inventors who have demonstrated a prolific spirit of innovation in creating or facilitating outstanding inventions that have made a tangible impact on quality of life, economic development and the welfare of society. The 2018 NAI Fellows class will be inducted at the Space Center Houston in April at the Eighth Annual Meeting of the NAI. Dr. Paul Davis selected as Top Endocrine Pharmacologist for 2018 by the International Association of Top Professionals (IAOTP) for his outstanding leadership and commitment to the profession. Dr. Davis is Adjunct Professor of Pharmacy at the Albany College of Pharmacy and Health Sciences and a Professor of Medicine at Albany Medical College. Dr. Shaker Mousa has been named a 2017 recipient of the Kuwait Prize, one of the world’s most prestigious awards for achievements in science. Sponsored by the Kuwait Foundation for the Advancement of Sciences (KFAS), this annual award recognizes lifetime contributions of Arab scientists across the globe. Dr. Mousa was honored in the category of Applied Sciences (Applied Medical & Applied Allied Health Sciences). The Kuwait Prize was first awarded in 1979. Award recipients are selected based on evaluations from local and international scientific institutions. PRI Celebrates 15 Years !! PJ Davis, HY Lin, AA Hercbergs, KA Keating, SA Mousa, (2019) How Thyroid Hormone Works Depends Upon Cell Type, Receptor Type, and Hormone Analogue: Implications in Cancer Growth. Discovery Medicine 27:111-117. Abstract The classical molecular mechanism of thyroid hormone involves the intranuclear interaction of 3,5,3′-triiodo-L-thyronine (T3) with thyroid hormone-specific nuclear proteins and consequent specific gene expression…. 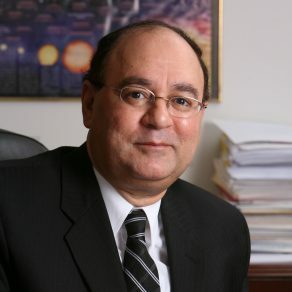 Shaker A. Mousa, Ph.D., M.B.A.
Dr Mousa wins the Kuwait Prize and travels to Kuwait the week of Dec 11 to receive the prize and deliver a series of lectures.